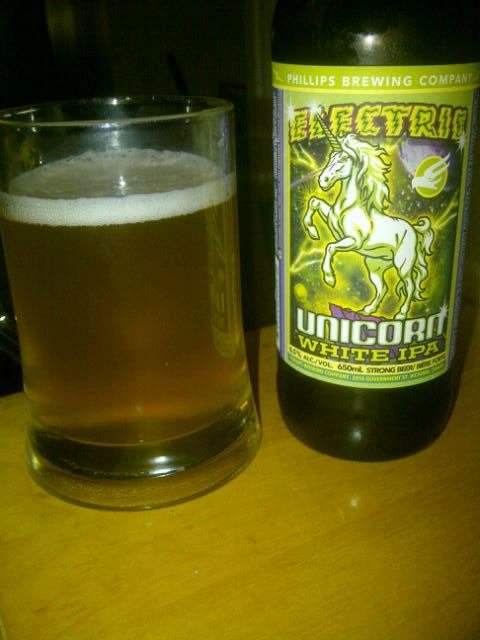 From Phillips Brewing out of Victoria BC comes the “Electric Unicorn White IPA”. This is a very interesting beer as it is both an IPA and a White beer. The beer pours a hazy yellow colour with a white head. The smell is of wheat, hops, orange and spices. The taste does not stray from the smell with wheat, hops, orange and spices. This is not a super hopy beer but very tasty. The alcohol content of this beer is 6.5%. This beer was a one off brewed beer which is unfortunate as it was very interesting. This entry was posted in India Pale Ale, Wheat Ale and tagged ale, bc, beer, canada, hops, hopy, ips, orange, phillips, single batch, spices, victoria, wheat, wheat ale, white.